Take a dhokla/idli steamer and boil water. Grease thali (cooking tray)and keep it ready. 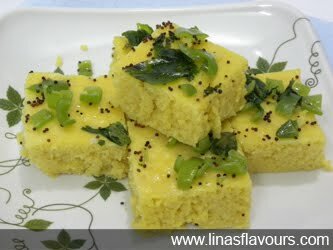 Take a bowl, add besan, semolina, salt, turmeric powder, green chilli-ginger paste, lemon juice, water and mix it well. The batter should be thick but of pouring consistency. If needed, add little more water. Finally, add Eno, pour 1 teaspoon water on it and whisk it well. Immediately pour the mix in the thali. Steam it for 12-15 minutes, till it is done. After 12 minutes, open the lid, insert the knife to check if it is done or not. If it comes out clean then it is done, otherwise steam it for 3-4 minutes more. Take it out and cut horizontally and vertically to make square or diamond shapes. Take a pan and heat oil for tempering. Add mustard seeds, green chillies, curry leaves and asafoetida. Switch off the gas stove. Stir it for 2-3 times and add water. Add sugar and mix it till it dissolves. Pour it on the khaman in thali, take out the pieces and serve it immediately. This is Gujarati special snack.